Sugar and Spice Cake is made of everything delicious and sweet, such as cinnamon, nutmeg, sugar, and of course, a little bit of cream. This Sugar and Spice Cake flavored coffee is a dreamy flavor combination that best resembles a delicious pastry filled with sweet, sugary icing and warming cinnamon undertones. 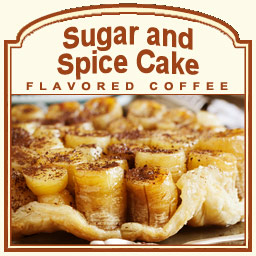 With only 2 calories per cup, this Sugar and Spice Cake coffee will appease your taste buds with its delicate sweetness. A heat-sealed valve bag will ensure the freshest coffee possible, which is why Flavored Coffee.com roasts and ships this coffee on the same day. This Sugar and Spice Cake coffee is the perfect treat for anyone looking to indulge in a morning pastry-inspired coffee. Thick in flavor, this Sugar and Spice Cake features a flavor that will wake any taste buds up early in the morning.